Our First Illuminating Powder Wich Mattifies, Highlights And Gives A Radiant Healthy Glow. Capturing the natural radiance of pearls, this new powder defines and illuminates the face. Designed in the form of a ring of pearls. 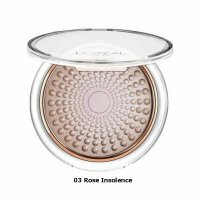 Contains a pearly highlighter and two light diffusing foundations.